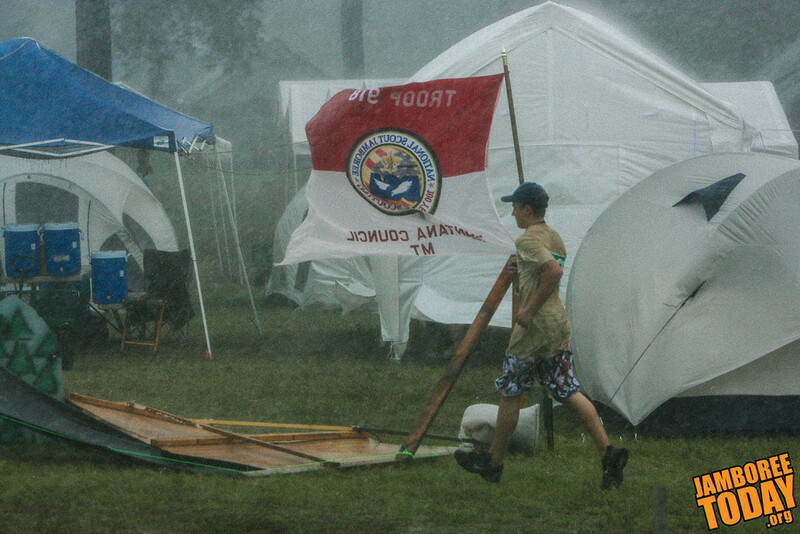 It never rains at the National Scout Jamboree. Really, it doesn’t. Yet the damp Scouts’ spirits did not seem dampened. As soon as the skies cleared, and the hot sun turned our corner of Virginia into a sauna, the Scouts jumped into action undeterred. They righted their tents, raised their gateways, and resumed their business with smiles. Scouting’s national honor society, the Order of the Arrow, teaches that Scouts should be cheerful as directed by the Scout Law, even in the face of tasks and responsibilities which are irksome and tiresome. We learn we should persist through hardship, and do so without letting it wear on our spirits. What a critical lesson. After all, what person doesn’t face challenges in their life? Disputes at work, balancing the demands of family life, making financial ends meet, and dealing with illness and tragedy never fun, and yet we all seem to have to deal with them to be successful in our lives. Individuals who learn to address their personal challenges, settle into their own emotions, and find positive and fulfilling vocations and hobbies have great, cheerful lives. Scouting teaches the skills necessary to accomplish this, mainly by presenting challenges appropriate to each age group. Cub Scouts in elementary school carve Pinewood Derby race cars. Boy Scouts in middle and high school earn merit badges in a number of subjects and complete an extensive leadership project. Venturers in high school and college push themselves through physical and intellectual trials. Adult Scouters dig into outdoor skills courses and youth development theory. Each stage builds upon the previous, although anyone can become involved at any point along the way. As Scouts progress, they learn about themselves and how they deal with adversity. They become comfortable in their own skin, confident in their ability to overcome any difficulty they encounter, and bounce back from the setback with a smile. After all, after the clouds disappointed, the only thing to see at the 2010 National Scout Jamboree was some wet grass and thousands of cheerful Scouts having the time of their lives. This week and next, I plan to blog about Scouting’s main principles as set out in the Scout Motto, Scout Law, and Scout Slogan.